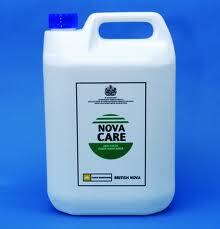 Novacare is a mopping fluid with a protective residue. Even the least skilled operator can restore the floor's appearance without leaving streak marks. Novacare dries to a pleasing finish without machine buffing. However, if burnished, the flexible residue will respond to give good recovery and a superb gloss. A premium quality floor maintainer containing a complex range of waxes to clean, protect and polish in one operation. Leaves a long lasting antistatic hard finish for use on vinyl, linoleum, thermoplastic tiles, sealed wood, sealed cork, terrazzo and marble floors. For a Gloss finish clean with COLD water. For a Satin Finish clean with WARM water. For best results use Nova Liquid 99 and Nova Starbrite before using this product.